The 250th anniversary of Robert Burns wasn’t simply a chance for thousands of revellers to enjoy a wee dram. The Famous Grouse, Scotland’s Number 1 whisky, helped many charities to enjoy a more prosperous 2009 by creating 250 limited edition bottles of 37 year old blended malt. In keeping with the humanitarian spirit of Burns, these bottles were only available for charity auction or raffle with a minimum value of £400. 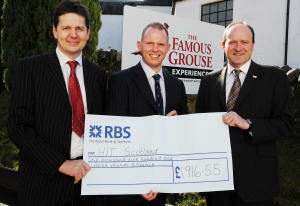 As a result, over £70,000 was raised at Burns Suppers and similar events around the world from auctioning The Famous Grouse limited edition blended whisky. >The Scottish Tourism Forum was successful in its application for a bottle to auction at its dinner held on 9 March to mark Scottish Tourism Week, and raised an impressive £1,916.55 for the Hospitality Industry Trust (HIT) through the sale of raffle tickets at the event. The creation of The Famous Grouse limited edition bottle formed part of the World Famous Burns Supper Campaign, a partnership between Homecoming Scotland 2009 and The Famous Grouse. The campaign encouraged people across the world to host their own Burns Supper, reaching a total of 3,600 registered suppers. The Famous Grouse 37 year old blended malt marked both Burns’ 250th birthday and the 37 years of his short but fruitful life. Renowned Scottish artist and playwright John Byrne was commissioned to create an original drawing of Robert Burns to adorn this limited edition whisky, making it a unique collector's item. Many Scottish charities incorporated these bottles into their fundraising efforts, and the goodwill was spread worldwide with many bottles being sent to Burns Suppers as far as Azerbaijan, China, Indonesia, Kazakhstan, Malawi, Latvia and the Ukraine.